I really hope she stays on track. Watching the strong loving bond between her, her sister and cousin was so touching. I didn’t get an enabling or denial vibe from them – and the grandmother, having experienced her daughter’s descent into hell will hopefully stay the course. I agree. It was one of the saddest episodes I have watched. She didn’t want to be where she was and her biggest mistake was going to her mom, but at the same time, she had been her mother’s support, so perhaps it was inevitable. Thank goodness for her sister and cousin. They are two strong women who gave their all to pull off an intervention on their own. I’m really proud of their effort. The future looks bright for Tanisha, but for her mum not so much. Tanisha seems to have embraced sobriety and wants to move forward in life, but Debbie has not hit rock bottom and seems to know no other life but that of an addict. 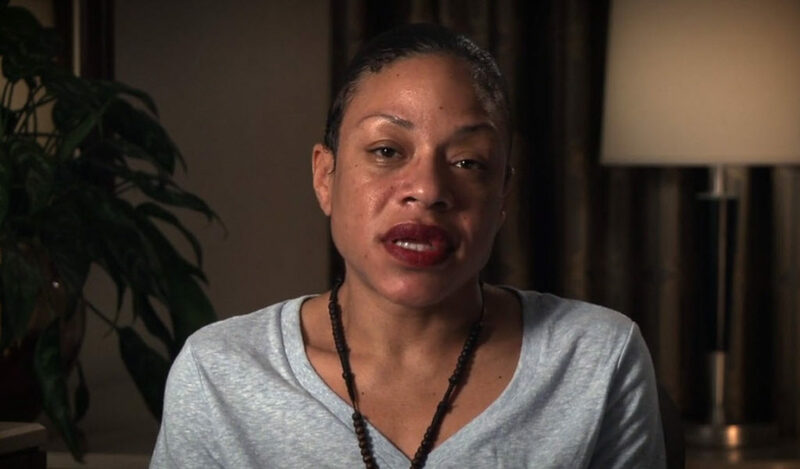 The key to Tanisha staying sober is to keep her mother out of her life until she gets clean – the bond between them is so strong that if Tanisha keeps her addict mother in her life the odds of her relapsing are very high. She’d also do well to stay the hell away from the entertainment industry, which is a toxic environment for a recovering addict. Donna has come a long way since her epic f*** up with Courtney. She was at the top of her game with Tanisha and did a fantastic job of handling her family and confronting the grandmother with her denial. It was also nice to see Donna talk a bit about her own story. She’s the one interventionist who had never before discussed her own background on the show, and we all learned a bit more about her last night. She’d mentioned understanding firsthand what it was like being in a prolonged psychotic state, didn’t she say it took over a year to recover from just that aspect? I think it might have been last season. I remember getting the impression that although she has probably the most guarded persona of all the interventionists, it may have the result of having emerged from one of the most deepest pits. Her memoir would be the one I would be most interested in reading. Donna discussed her situation during Sierra’s episode. Perhaps you missed that one. I can’t remember any of the interventionists’ back stories except for Candy really. Candy: adopted as a baby, married a famous music producer, stay at home mum who took up drink largely out of boredom, became an alcoholic and was “intervened” on by her mother in law, then went back to school got her degree in addiction counseling from UCLA and has been sober 30+ years. Ken: got heavily involved in the gay club/drug scene in the 1980s as a young man and got hooked on meth (meth was the popular drug of choice among gay men at that time). Sober since the late 1980s. Owns the intervention/counseling business that trained Donna. Jeff: trained as a minister, became an alcoholic. Got sober in the 1970s, got his degree in addiction counseling, wrote several books. Had a brief relapse around 2010 (had to take a hiatus from the show) but has been sober ever since. Mentored Sylvia as she began her career as an addiction counselor. Donna: Worked in the music industry in the 1990s and got hooked on crack and meth. Sober since the mid 1990s and trained by Ken. Seth: grew up in Hell’s Kitchen and got hooked on heroin as a young man and was in and out of jail on small-time charges. Got sober in the 1980s/1990s and got into acting (had several bit parts in movies and TV shows), then got into the addiction treatment business. Damn, impressive! Thank you for that. Wow!!! I didn’t know anyone’s stories except Donna and Silvia! I knew Candy and Jeff were alcoholics, but not the actual impetus behind their addictions. Thank you! I’m going to give Ken a plug: https://intervention911.com/ That’s the link to the intervention and counseling business he owns. Wow! I had some vague pieces of info here and there but thanks for the great summaries. Actually Donna was a Hollywood insider and agent representing actors and directors at CAA, she was Wesley Snipe’s agent. A LA native she went to Beverly Hills HS and then USC. I miss you already! Say strong!! This episode really touched me. Tanisha has such a good head on her shoulders, and the love between her family is so real and touching. Her story is so tragic, I can’t even imagine the emotional toll taken on her after that terrible murder. The intervention was so lovely and heartfelt. Her grandmother’s letter brought me to tears, it was so genuine and so sweet. I wish Tanisha the best, brightest future! She’s a sweet, smart lady and I believe she can turn her life back around! This episode was a tear-jerker. Those three women in the intervention had so much love for their sister/cousin/granddaughter. Donna was the perfect interventionist to guide them along the way. I really hope Tanisha is doing well. She seems like a genuine, sweet person who deserves a good life. The same goes for her sister, cousin and grandmother. I also hope Tanisha’s mom finds her way before it’s too late. It’s not surprising that Tanisha’s mom didn’t last in treatment. Very sad, though. I hope that Tanisha can break the dangerous bond between her and her mom. Unfortunately, her sobriety means severing ties with her mom. Tanisha’s cousin is so real and down-to-earth. Really enjoyed this episode and seeing the bond between Tanisha and Tiffany. I think Tanisha has what it takes to recover and have a good life. I’m one of the people who hasn’t really cared for Donna’s intervention style in the past (one incident sticks with me – I can’t remember the addict’s name but when he came into the intervention, she sighed, shrugged her shoulders and introduced herself in a very negative way. I think it was the man who lived with his parents who made millions in the pear industry – her attitude was so negative through the whole discussion that I was FURIOUS!! ), but I have to say this was a beautiful intervention. I liked seeing Donna “get real” and open up to the addict. I know that doesn’t work with every addict but showing vulnerability seems to go a long way sometimes. Somewhere in these discussions I was accused of being racist because I didn’t care for Donna’s style – it didn’t warrant a response because it’s utterly ridiculous. My only critique is on how they treat the addict. Tanisha is doing well. I’m not going to post the link but she commented on her episode on another site. She said she wished her story hadn’t been recorded for the world to see, but she does appreciate intervention for saving her life. So many of these episodes have people pseudo-crying, where they dab at their eyes even though no tears are evident. Tanisha was so obviously sincere and honest in what she said, in the emotions she expressed —- I actually adored the honest emotion. lyric. It does not, ultimately, have to be done alone. Indeed. Apparently the group wrote that song originally to raise money for refugees, but it fits very well with the show too.